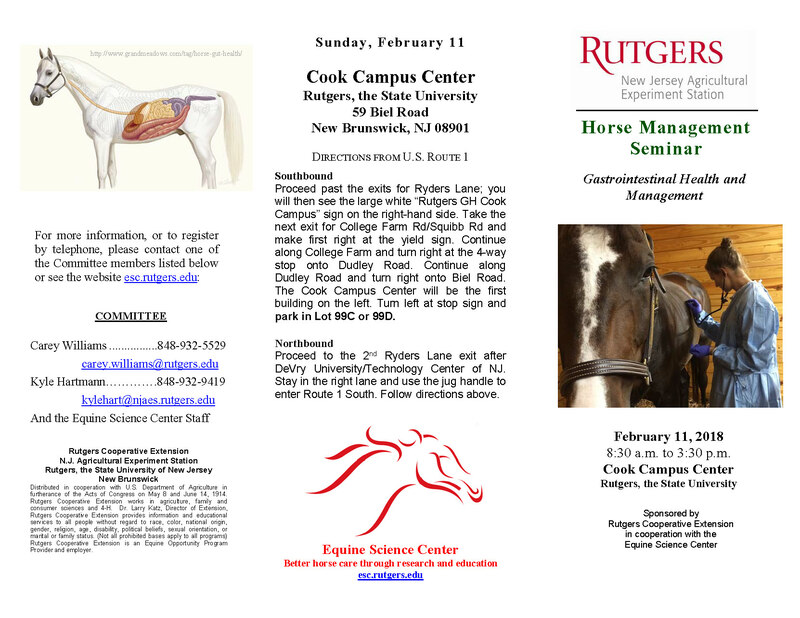 New Brunswick, N.J. – “ “Gastrointestinal Health and Management” is the over-arching theme of the upcoming Horse Management Seminar hosted by the Rutgers Equine Science Center and Rutgers Cooperative Extension. The seminar, scheduled from 8:30am – 3:30pm on Sunday, February 11, 2018, will feature presentations by several equine experts. Williams has assembled presenters who are recognized as experts in their field to offer perspectives and personal insight. The morning will start with topics including “How does physically effective fiber behave in the equine gut? – A visual tour” by Dr. Burt Staniar from Pennsylvania State University. Dr. Staniar will follow up with useful research from his lab and others with “An overview of recent research studying physically effective fiber and equine gastrointestinal health.” Later in the morning, Dr. Mary Durando from Equine Sports Medicine Consultants will focus her presentation on “Equine Gastric Ulcers Syndrome”. The afternoon will start off with “The Equine Microbiome” by Dr. Amy Biddle, from the University of Delaware, which will then lead into a panel discussion from the three main speakers moderated by Dr. Carey Williams. Following the panel Dr. Williams and her doctoral student, Jennifer Weinert, will present a few short presentations on some current and future research, “Gastrointestinal Health and Management of Eventing Horses: Survey Results” and “Microbiome and Metabolism of Horses on Pasture: Future Study”. In addition to the educational presentations, the seminar will feature informational displays, networking opportunities with industry companies and area organizations, and ample time for one-on-one discussions with the day’s presenters. Complete program, registration information, and seminar brochure can be found at https://goo.gl/2ZNHR2. Dr. Carey Williams can be contacted at 848-932-5529, or carey.williams@rutgers.edu. Space is limited, so be sure to register early; the early bird discount registration ends on January 29th!